When the end of the week approaches we spotlight low-carb recipes you might want to try over the weekend, and this week I’m reminding you about these 20 Amazing Low-Carb Salads with Zucchini! Check out Zucchini Recipes to see more ideas for using up that zucchini! Click here to PIN 20 Amazing Low-Carb Salads with Zucchini! Did you know that yesterday was Sneak Some Zucchini onto Your Neighbor’s Porch Day? When I had a big garden I used to love having the problem of too much zucchini! And if you’re lucky enough to have a zucchini surplus and are looking for ideas for using zucchini check out of my collections of The Top Ten Most Popular Low-Carb Zucchini Recipes on Kalyn’s Kitchen and 50 Amazing Zucchini Recipes for Sneak Some Zucchini onto Your Neighbor’s Porch Day. It’s obvious that I’m a huge zucchini fan and I’ve come up with a lot of good zucchini recipes through the years. But right now in Utah temperatures have been hovering close to 100F for weeks and anything that heats up the kitchen doesn’t sound that appealing. So I’m featuring this collection of 20 Amazing Low-Carb Salads with Zucchini to help you use the your zucchini while staying cool! There are salads here with raw zucchini or with zucchini that’s par-boiled or grilled before being made into a salad, and a few of these zucchini salads are favorite recipes I’ve made over and over. I’m also including low-carb zucchini salads from some of my food blogging friends, so if you haven’t thought of using zucchini in a salad, have fun experimenting with these recipes! And of course some of the Low-Carb Salads with Zucchini use zucchini noodles, and I’ve shared Three Ways to Make Noodles from Zucchini if you need help with that. And I couldn’t resist including a few zucchini salads with tomatoes, even though I know tomatoes aren’t super low in carbs, so you may have to use stricter portion control or use less tomatoes on those salads if you’re doing Keto or a really strict low-carb plan. Or just pick other salads that don’t have tomatoes! 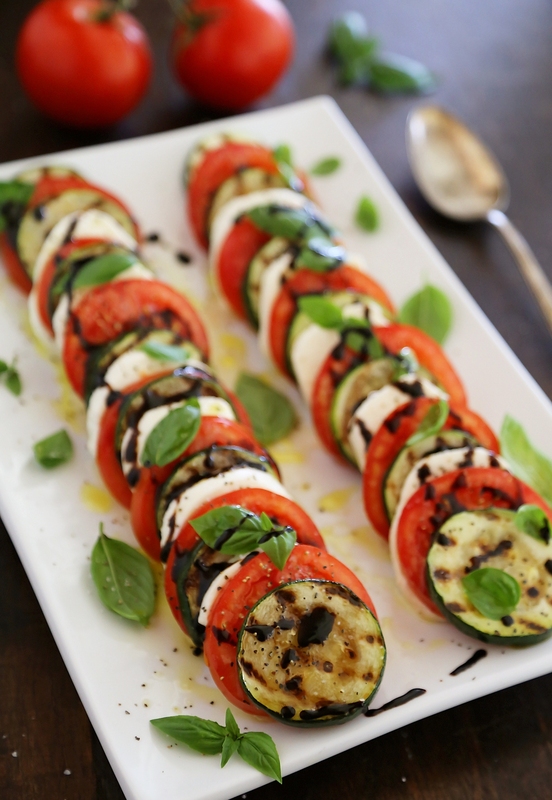 You have to agree that this Grilled Zucchini Caprese Salad from The Comfort Kitchen looks pretty fabulous! Marinated Zucchini Salad with Olives, Artichokes, and Red Pepper from Kalyn’s Kitchen is a salad I have enjoyed for years and I’ve made this many times for parties! I’m seriously swooning over this Zucchini Ribbon Salad with Hazelnuts and Feta from Healthy Seasonal Recipes! 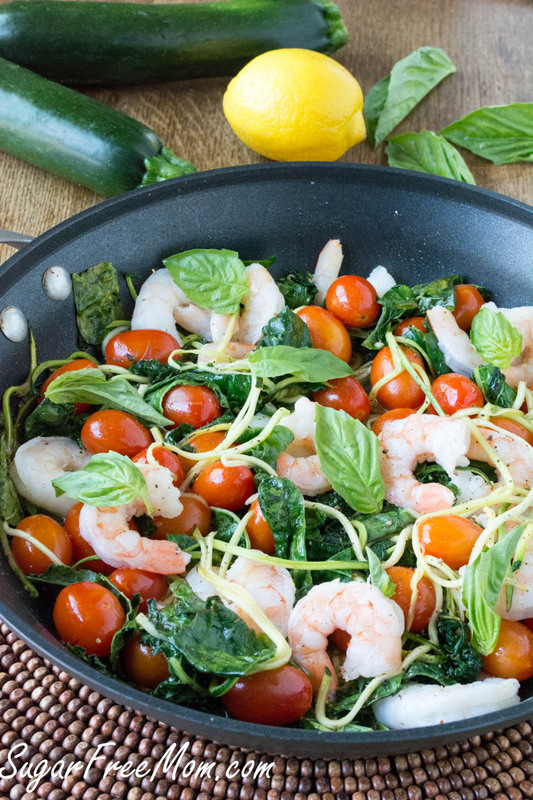 Yes, please, to this Wilted Kale Shrimp Zucchini Noodle Salad from Sugar Free Mom. Grilled Zucchini Caprese Stacks from Kalyn’s Kitchen are a lovely composed salad for a dinner party! I promise this one will impress your guests. I love the flavors and colors in this Tricolor Thai Salad with Zucchini and Yellow Squash from Cookin’ Canuck! It’s no surprise that I love this Spicy Grilled Eggplant and Zucchini Salad with Thai Flavors from Kalyn’s Kitchen since my love of grilled eggplant and grilled zucchini is pretty well-documented on this blog! How could you go wrong with Grilled Zucchini and Feta Salad from Apron Strings? 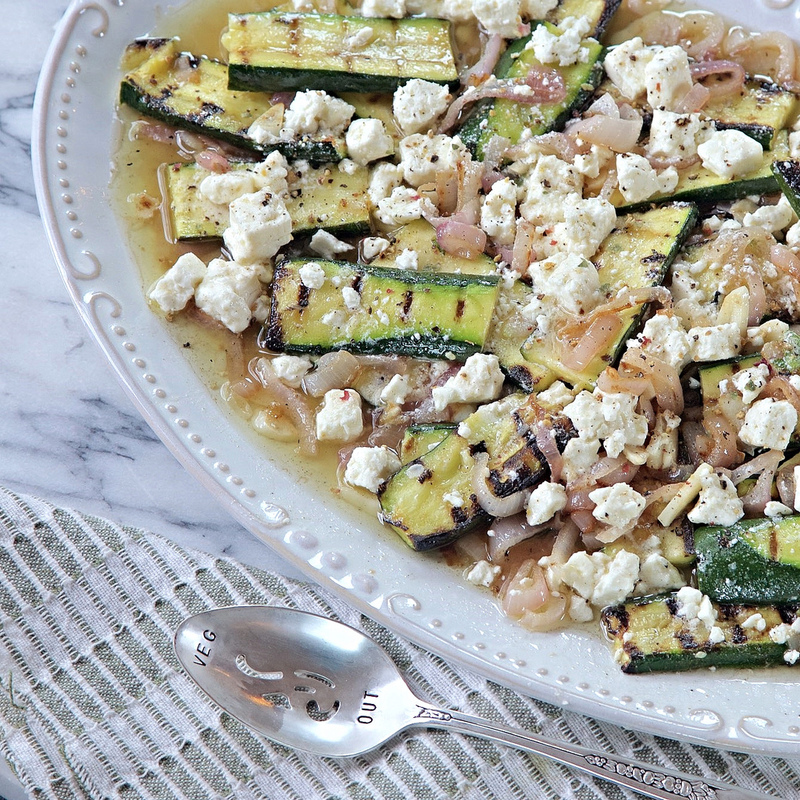 I think zucchini + Feta is an inspired combination! Grilled Zucchini Greek Salad from Kalyn’s Kitchen replaces the cucumber that’s traditional in Greek Salad with grilled zucchini and this one continues the zucchini + Feta theme! Zucchini Carpaccio from Skinnytaste gets even better with the addition of arugula! Shaved Zucchini Salad with Parmesan and Pine Nuts from The Noshery also sounds delicious! You won’t see too many salads with raw zucchini in pieces, but it works in this Bacon, Tomato, and Zucchini Salad with Feta from Kalyn’s Kitchen. 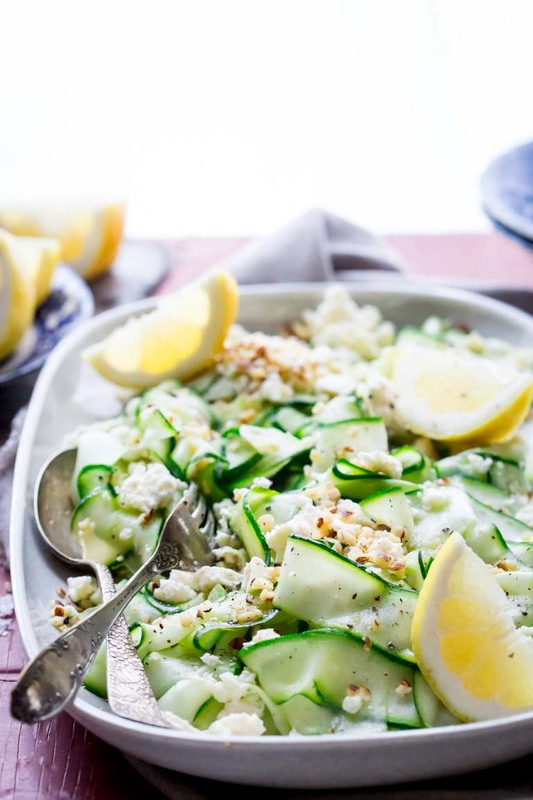 There are so many good flavors in this Lemon and Feta Summer Zucchini Salad from Joy Filled Eats! 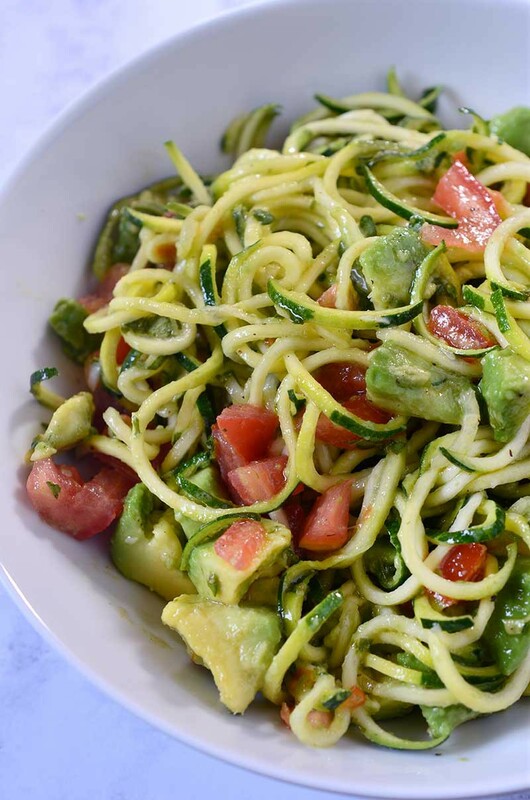 Love the addition of avocado in this Zucchini Noodle, Tomato, and Avocado Salad from Life’s Ambrosia. It’s the pieces of spicy Italian sausage that makes me absolutely LOVE, LOVE, LOVE this Zucchini Noodle Mock Pasta Salad from Kalyn’s Kitchen. 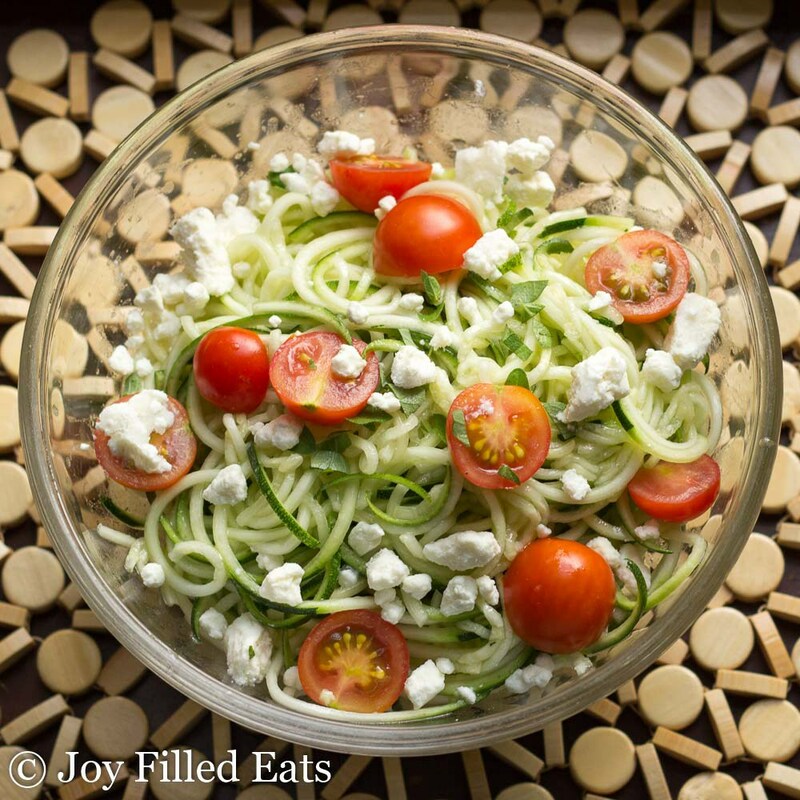 Of course you know I’d like this Zucchini Noodles Greek Salad from Cupcakes and Kale Chips! I love the addition of radicchio, parsley, and walnuts in this Zucchini Noodles Salad with Parmesan and Walnuts from I Breathe I’m Hungry! It could use a new photo maybe, but this Zucchini Carpaccio (Raw Zucchini Salad with Lemon, Herbs, and Goat Cheese) from Kalyn’s Kitchen is perfect for hot weather! So many good flavors in Zucchini Noodle Mediterranean Salad from Boulder Locavore! Chicken Pesto Zucchini Noodle Salad from Kalyn’s Kitchen is another tasty option with spiralized zucchini noodles! —Use the Index for Low-Carb Recipes to see all the low-carb recipes that have been featured on this site. —Check out the Recipe Round-Ups for more round-ups like this one. —Want Low-Carb Meatless Recipes? I’ve got a Pinterest board for that! Thanks, my pleasure! WordPress is catching me up on the world of Pingbacks!